Mycobacterium bovis (M. bovis) is a slow-growing (16- to 20-hour generation time) aerobic bacterium and the causative agent of tuberculosis in cattle (known as bovine TB). It is related to Mycobacterium tuberculosis, the bacterium which causes tuberculosis in humans. M. bovis can jump the species barrier and cause tuberculosis in humans and other mammals. The bacteria are curved or straight rods (Mycobacterium Family). They sometimes form filaments, which fragment into bacilli or cocci once disturbed. In tissues they form slender rods, straight or curved, or club-shaped. Short, relatively plump bacilli (rods) in tissue smears, large slender beaded rods in culture. They have no flagella or fimbria, no capsule. Mycobacterium tuberculosis group bacteria are 1.0 - 4.0 µm long by 0.2 - 0.3 µm wide in tissues. In culture they may appear as cocci, or as bacilli up to 6 - 8 µm long . The bacteria stain Gram-positive, acid-fast. The cell wall contains as high as 60% lipid, giving the mycobacteria their hydrophobic characteristics, slow growth and resistance to dessication, disinfectants, acids and antibodies. (MycobacteriumFamily). They are not easy to stain with analine dyes; although they are Gram positive it may not be easy to confirm this. 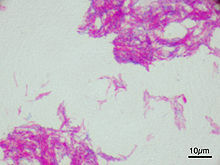 Ziehl-Neelsen staining results in stain pink with hot carbol fuscin and then resist decolourisation with 3 percent hydrochloric acid in 95% alcohol (i.e. they are acid-alcohol fast); following washing, the slide is counterstained with e.g. methylene blue. Mycobacterium bovis is a facultative intracellular parasite. For in vitro growth, special culture media are required, for example Dorset's egg medium incorporates egg yolk, phosphate buffer, magnesium salts and sodium pyruvate; amino acids may be added but glycerol is not included as it is inhibitory. It is Inhibited by glycerine. Culture generally requires several weeks at 37 °C to reach colonies visible to the unaided human eye. Strictly aerobic. Grows at 37 °C, does not grow at 25 °C. Optimum growth at 37-38 °C. Does not reduce nitrate, does not reduce niacin. Resistant to pyrazineamide. Sensitive to thiophene-2-carboxylic acid hydrazide. Initially (after 3-4 weeks), minute dull flakes, thickening to form dry irregular masses standing high above the culture medium surface. Eventually confluentgrowth over the whole culture surface, forming a rough waxy blanket, becoming thick and wrinkled and reaching up the sides of the container. Yellow when they are first visible, darkening to deep yellow and eventually brick red, if exposed to light. In fluid media, growth on the surface only, unless a wetting agent (e.g. Tween 80) is added to the medium. During the first half of the 20th century, M. bovis is estimated to have been responsible for more losses among farm animals than all other infectious diseases combined. Infection occurs if the bacterium is ingested. M. bovis is usually transmitted to humans by consuming raw, infected cows' milk, although it can also spread via aerosol droplets. Actual infections in humans are nowadays rare in developed countries, mainly because pasteurisation kills M. bovis bacteria in infected milk. In the UK, cattle are tested for the disease as part of an eradication program and culled if they test positive. Such cattle can still enter the human food chain, but only after a government veterinary surgeon has inspected the carcass and certified that it is fit for human consumption. However, in areas of the developing world where pasteurisation is not routine, M. bovis is a relatively common cause of human tuberculosis. Bovine tuberculosis is a chronic infectious disease which affects a broad range of mammalian hosts, including humans, cattle, deer, llamas, pigs, domestic cats, wild carnivores (foxes, coyotes) and omnivores (common brushtail possum, mustelids and rodents); it rarely affects equids or sheep. The disease can be transmitted in several ways; for example, it can be spread in exhaled air, sputum, urine, faeces, and pus, so the disease can be transmitted by direct contact, contact with the excreta of an infected animal, or inhalation of aerosols, depending on the species involved. M. bovis is the ancestor of the most widely used vaccine against tuberculosis, M. bovis bacillus Calmette-Guérin. BCG is a strain that was created by growing M. bovis on potato slices soaked in ox-bile and glycerol over a period of 13 years. In New Zealand, the introduced common brushtail possum is a vector for the spread of M. bovis. The Biosecurity Act 1993, which established a national pest-management strategy, is the legislation behind control of the disease in New Zealand. The Animal Health Board operates a nationwide programme of cattle testing and possum control, with the goal of eradicating M. bovis from wild vector species across 2.5 million hectares – or one-quarter – of New Zealand’s at-risk areas, by 2026 and, eventually, eradicating the disease entirely. The TB-free New Zealand programme is regarded as "world-leading". It has successfully reduced cattle and deer herd infection rates from more than 1700 in 1994 to fewer than 100 herds in July 2011. Much of this success can be attributed to sustained cattle controls reducing cross-infection and breaking the disease cycle. For example, at Hohotaka, in New Zealand's central North Island, control work from 1988 to 1994 achieved a sustained mean reduction of 87.5% in the density of TB‐infected opossums. As expected, annual TB incidence in local cattle herds consequently declined by a similar amount (83.4%). Possums are controlled through a combination of trapping, ground-baiting, and where other methods are impractical, aerial treatment with 1080 poison. From 1979 to 1984, possum control was stopped due to lack of funding. From that point until 1994, TB rates in herds steadily increased. The area of New Zealand harbouring TB-infected wild animals expanded from about 10% of the country to 40%. That possums are such effective transmitters of TB appears to be facilitated by their behaviour once they get the disease. This behaviour has been captured on video. In the 1930s, 40% of cattle in the UK were infected with M. bovis and 50,000 new cases of human M. bovis infection were reported every year. According to DEFRA and the Health Protection Agency, the risk to people contracting TB from cattle in Great Britain today is very low. The HPA has said that three-quarters of the 440 human cases reported to the HPA between 1994 and 2006 were aged 50 years and above and only 44 cases (10%) were known to be non-UK born. Badgers (Meles meles) were first identified as carriers of M. bovis in 1971, but the report of an independent review committee in 1997 (the Krebs Report) concluded: 'strong circumstantial evidence [exists] to suggest that badgers represent a significant source of M. bovis infection in cattle... [h]owever, the causal link... has not been proven'. In essence, the contribution of badgers 'to the TB problem in British cattle' was at this point a hypothesis that needed to be tested, according to the report. The subsequent Randomised Badger Culling Trial  (designed, overseen and analysed by the Independent Scientific Group on Cattle TB, or ISG ) examined this hypothesis by conducting a large field trial of widescale (proactive) culling and localised reactive culling (in comparison with areas which received no badger culling). In their final report, the ISG concluded: "First, while badgers are clearly a source of cattle TB, careful evaluation of our own and others’ data indicates that badger culling can make no meaningful contribution to cattle TB control in Britain. Indeed, some policies under consideration are likely to make matters worse rather than better. Second, weaknesses in cattle-testing regimens mean that cattle themselves contribute significantly to the persistence and spread of disease in all areas where TB occurs, and in some parts of Britain are likely to be the main source of infection. Scientific findings indicate that the rising incidence of disease can be reversed, and geographical spread contained, by the rigid application of cattle-based control measures alone." On 26 July 2007, the Minister of State, Department for Environment, Food and Rural Affairs (Lord Rooker) said, "My Lords, we welcome the Independent Scientific Group’s final report, which further improves the evidence base. We are carefully considering the issues that the report raises, and will continue to work with industry, government advisers, and scientific experts in reaching policy decisions on these issues." In the UK, many other mammals have been found to be infected with M. bovis, although the frequency of isolation is generally much less than cattle and badgers. In some areas of south-west England, deer, especially fallow deer due to their gregarious behaviour, have been implicated as possible maintenance hosts for transmission of bovine TB, a disease which in the UK in 2005 cost £90 million in attempts to eradicate. In some localised areas, the risk of transmission to cattle from fallow deer has been argued to be greater than it is from badgers. The main reason that the Department for Environment, Food, and Rural Affairs requires infected or suspected cattle to be culled is to meet EU regulations for the export of meat and dairy products to other member states. No ethical or veterinary reason exists as to why infected animals cannot continue to live out their lives until the normal age for slaughter. All meat and dairy products can still be sold into the human food chain, providing the relevant carcass inspections and milk pasteurisation have been applied. Spread of the disease to humans by domestic pets became evident in March 2014 when Public Health England announced two people in England developed bTB infections after contact with a domestic cat. The two human cases were linked to 9 cases of bTB infection in cats in Berkshire and Hampshire during 2013. These are the first documented cases of cat-to-human transmission. In a 2010 opinion piece in Trends in Microbiology, Paul and David Torgerson argued that bovine tuberculosis is a negligible public-health problem in the UK, providing milk is pasteurized. Bovine TB is very rarely spread by aerosol from cattle to humans. Therefore, the bovine tuberculosis control programme in the UK in its present form is a misallocation of resources and provides no benefit to society. Indeed, very little evidence exists of a positive cost benefit to the livestock industry, as few studies have been undertaken on the direct costs of bovine TB to animal production. Milk pasteurisation was the single public health intervention that prevented the transmission of bovine TB to humans, and no justification for the present test and cull policy in the UK is seen. In July 2010, the second issue of the discussion document Bovine TB, Time for a Rethink  was published by Rethink Bovine TB, an independent research group. The paper considers current policy in England and Wales. It proposes an alternative solution that is both practical and cost effective. In the paper, evidence is drawn from DEFRA and the work by Professors Paul and David Torgerson. In March 2012, think tank the Bow Group published a target paper urging the government to reconsider its plans to cull thousands of badgers to control bovine TB, stating that the findings of Labour's major badger-culling trials several years prior were that culling does not work. The paper was authored by Graham Godwin-Pearson with a foreword by singer Brian May and contributions by leading tuberculosis scientists, including Lord Krebs. As of the end of 2013, the USDA has accredited cattle herds in all US states except for Michigan and California as being free from bovine TB. M. bovis infections in cattle herds in the United States is not common. M. bovis is endemic in white-tailed deer (Odocoileus virginianus) in the northeastern portion of Michigan and northern Minnesota, and sporadic import of the disease from Mexico. Only the white-tailed deer has been confirmed as a maintenance host in the Michigan outbreak of bovine tuberculosis, although other mammals such as raccoons (Procyon lotor), opossums (Didelphis virginiana), and coyotes (Canis latrans) can serve as spill-over and dead-end hosts. The fact that white-tailed deer are a maintenance host for M. bovis remains a significant barrier to the US nationwide eradication of the disease in livestock. In 2008, 733,998 licensed deer hunters harvested around 489,922 white-tailed deer in attempts to control the disease spread. These hunters purchased more than 1.5 million deer-harvest tags. The economic value of deer hunting to Michigan’s economy in the drive to eradicate TB is substantial. For example, in 2006, hunters spent US$507 million hunting white-tailed deer in Michigan. The disease is found in cattle throughout the globe, but some countries have been able to reduce or limit the incidence of the disease through a process of 'test and cull' of the cattle stock. Most of Europe and several Caribbean countries (including Cuba) are virtually free of M. bovis. Australia is officially free of the disease since the successful BTEC program, but residual infections might exist in feral water buffalo in isolated parts of the Northern Territory. In Canada, affected wild elk and white-tailed deer are found in and around Riding Mountain National Park in Manitoba. To improve control and eliminate bovine TB, the Canadian Food Inspection Agency has split Manitoba into two management areas: The Riding Mountain TB eradication area, where the disease has been found, and the Manitoba TB Eradication Area, the rest of the province outside RMEA where the disease has not been found. The disease has also been found in African buffalo in South Africa. M. bovis can be transmitted from human to human; an outbreak occurred in Birmingham, England, in 2004, and from human to cattle, but such occurrences are rare. In Mexico, the disease is prevalent and rising among humans. M. bovis is innately resistant to pyrazinamide; therefore, the standard treatment is isoniazid and rifampicin for 9 months. However, most cattle with TB are culled. ^ Karlson, A. G.; Lessel, E. F. (1970). "Mycobacterium bovis nom. nov". International Journal of Systematic Bacteriology. 20 (3): 273–282. doi:10.1099/00207713-20-3-273. ^ Grange, John M.; Yates, Malcolm D.; de Kantor, Isabel N. (1996). "Guidelines for speciation within the Mycobacterium tuberculosis complex. Second edition" (PDF). World Health Organization. Retrieved 2007-08-02. ^ O'Reilly LM, Daborn CJ. (August 1995). "The epidemiology of Mycobacterium bovis infections in animals and man: a review". Tuber Lung Dis. 76 (Suppl 1): 1–46. doi:10.1016/0962-8479(95)90591-X. PMID 7579326. ^ Delahay, R.J.; De Leeuw, A.N.S. ; Barlow, A.M.; Clifton-Hadley, R.S. ; Cheeseman, C.L. (2002). "The status of Mycobacterium bovis infection in UK wild mammals: A review". The Veterinary Journal. 164 (2): 90–105. doi:10.1053/tvjl.2001.0667. PMID 12359464. ^ Phillips, C.J.C. ; Foster, C.R.W. ; Morris, P.A. ; Teverson, R. (2001). "The transmission of Mycobacterium bovis infection to cattle". Research in Veterinary Science. 74: 1–15. PMID 12507561. ^ "TBfree New Zealand programme". ^ "Bovine TB control: What are other countries doing?". 21 July 2011. ^ Kean, J.M. ; Barlow, N. D.; Hickling, G.J. (1999). "Evaluating potential sources of bovine tuberculosis infection in a New Zealand cattle herd". New Zealand Journal of Agricultural Research. 42: 101–106. doi:10.1080/00288233.1999.9513358. ^ "The use of 1080 for pest control - 3.1 Possums as reservoirs of bovine tuberculosis". 2011. ^ "Future freedom from bovine TB, Graham Nugent (Landcare Research)". 2011. Archived from the original on 2012-03-30. ^ "Dr Paul Livingstone letter to the editor". Gisborne Herald. 26 May 2011. Archived from the original on September 27, 2011. ^ Reynolds D (2006). "A review of tuberculosis science and policy in Great Britain". Vet Microbiol. 112 (2–4): 119–126. doi:10.1016/j.vetmic.2005.11.042. PMID 16343818. ^ Krebs JR, Anderson T, Clutton-Brock WT (1997). Bovine tuberculosis in cattle and badgers: an independent scientific review. London: Ministry of Agriculture, Fisheries and Food. ^ defra. "Bovine TB: Randomised Badger Culling Trial (RBCT)". Archived from the original on 2007-08-07. Retrieved 2007-07-30. ^ defra. "Bovine TB: The Independent Scientific Group on Cattle TB". Archived from the original on 2007-08-11. Retrieved 2007-07-30. ^ Independent Scientific Group on Cattle TB. "Bovine TB: The Scientific Evidence; Final Report of the Independent Scientific Group on Cattle TB Presented to the Secretary of State for Environment, Food, and Rural Affairs The Rt Hon David Miliband MP, June 2007" (PDF). Archived from the original (PDF) on 2007-08-05. Retrieved 2007-07-30. ^ Daily Hansard. "Daily Hansard, House of Lords; Thursday, 26 July 2007". Retrieved 2007-07-30. ^ a b Delahay, R. J.; Smith, G. C.; Barlow, A. M.; Walker, N.; Harris, A.; Clifton-Hadley, R. S.; Cheeseman, C. L. (2007). "Bovine tuberculosis infection in wild mammals in the South-West region of England: A survey of prevalence and a semi-quantitative assessment of the relative risks to cattle". The Veterinary Journal. 173 (2): 287–301. doi:10.1016/j.tvjl.2005.11.011. PMID 16434219. ^ a b Ward, A. I.; Smith, G. C.; Etherington, T. R.; Delahay, R. J. (2009). "Estimating the risk of cattle exposure to tuberculosis posed by wild deer relative to badgers in England and Wales". Journal of Wildlife Diseases. 45 (4): 1104–1120. doi:10.7589/0090-3558-45.4.1104. PMID 19901384. ^ The Veterinary Record (2008). "Bovine TB: EFRACom calls for a multifaceted approach using all available methods". The Veterinary Record. 162 (9): 258–259. doi:10.1136/vr.162.9.258. PMID 18350673. ^ Bain, John (4 April 2017). "Intra-Union Trade in Bovine Animals for Breeding/Production" (PDF). defra.gov.uk. Archived from the original (PDF) on Feb 2017. Retrieved 4 April 2017. ^ Agency, Food Standards. "Food chain information model document for animals susceptible to bovine tuberculosis | Food Standards Agency". www.food.gov.uk. Retrieved 2017-04-14. ^ "Pet cats infect two people with TB". BBC. 27 March 2014. Retrieved 28 March 2014. ^ a b Torgerson, PR; Torgerson, DJ (2010). "Public health and bovine tuberculosis: what's all the fuss about?". Trends in Microbiology. 18 (2): 67–72. doi:10.1016/j.tim.2009.11.002. PMID 19944609. ^ "Bow Group urges the Government to Scrap Badger Cull plans". Bow Publishing. 25 Mar 2012. Archived from the original on 2012-04-28. Retrieved 2012-04-28. ^ Barkham, Patrick (26 Mar 2012). "Badger Cull divides Tories". The Guardian. The Guardian. Retrieved 2012-04-28. ^ "Now even Tories are calling for the badger cull to be scrapped". Western Morning News. 3 Apr 2012. Retrieved 2012-04-28. ^ Status of Current Eradication Programs (PDF) (Report). United States Department of Agriculture. 3 Dec 2013. Retrieved 7 July 2014. ^ Witmer, G.; Fine, A. E.; Gionfriddo, J.; Pipas, M.; Shively, K.; Piccolo, K.; Burke, P. (2010). "Epizootiological survey of Mycobasterium bovis in wildlife and farm environments in Northern Michigan" (PDF). Journal of Wildlife Diseases. 46 (2): 368–378. doi:10.7589/0090-3558-46.2.368. PMID 20688630. ^ O’Brien, D. J.; Schmitt, S. M.; Fitzgerald, S. D.; Berry, D. E. (2011). "Management of bovine tuberculosis in Michigan wildlife: Current status and near term prospects". Veterinary Microbiology. 151 (1–2): 179–187. doi:10.1016/j.vetmic.2011.02.042. PMID 21414734. ^ "Nightclub linked to TB outbreak". Metro. 2006-10-12. ^ Griffith AS and Munro WT (1944). "Human pulmonary tuberculosis of bovine origin in Great Britain". J Hyg. 43 (4): 229–40. doi:10.1017/S0022172400012894. PMC 2234683. PMID 20475680. ^ Tice FJ (1944). "Man, a source of bovine tuberculosis in cattle". Cornell Vet. 34: 363–5. ^ Valle, Miriam Bobadilla-del; Torres-González, Pedro; Cervera-Hernández, Miguel Enrique; Martínez-Gamboa, Areli; Crabtree-Ramirez, Brenda; Chávez-Mazari, Bárbara; Ortiz-Conchi, Narciso; Rodríguez-Cruz, Luis; Cervantes-Sánchez, Axel; Gudiño-Enríquez, Tomasa; Cinta-Severo, Carmen; Sifuentes-Osornio, José; León, Alfredo Ponce de (30 September 2015). "Trends of Mycobacterium bovis Isolation and First-Line Anti-tuberculosis Drug Susceptibility Profile: A Fifteen-Year Laboratory-Based Surveillance". PLOS Neglected Tropical Diseases. 9 (9): e0004124. doi:10.1371/journal.pntd.0004124. PMC 4589280. PMID 26421930. Background on immunology and testing for Bovine TB - The background on immunology and testing for Bovine Tuberculosis. This page was last edited on 16 April 2019, at 16:46 (UTC).